Paul, a Kentucky Republican and toast of the tea party movement, promised a “historic” fight against the NSA when he announced the suit had been filed Wednesday at a press conference. He was joined by Ken Cuccinelli, Virginia’s former attorney general, and Matt Kibbe, the president and CEO of the tea party-affiliated FreedomWorks. Bruce Fein, a Reagan administration attorney, is one of the lawyers on the case. The suit challenges the constitutionality of the NSA program that collects metadata on US citizens’ phone calls. “There’s a huge and growing swell of protest in this country of people who are outraged that their records are being taken without suspicion, without a judge’s warrant, and without individualization,” Paul said. Paul began telling the press about the lawsuit weeks ago. 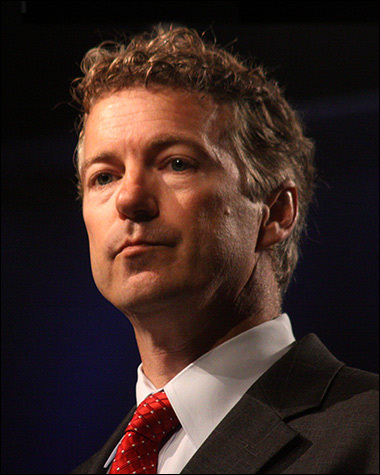 This, along with a 13-hour filibuster on drone activity inside the US delivered in March 2013, has fueled expectations that Paul will be among the Republican presidential candidates in 2016. The Obama administration has consistently maintained the data collection program, first unveiled last year by NSA whistleblower Edward Snowden, is legal. The 15 judges on the Foreign Intelligence Surveillance Court have reauthorized the data collection program every 90 days since 2006. In 1979 the US Supreme Court ruled that metadata – including the time of a call, its duration, and numbers dialed – is not protected by the Fourth Amendment. “We remain confident that the program is legal, as at least 15 judges have previously found,” Justice Department spokesman Peter Carr said Wednesday in response to Senator Paul’s announcement.